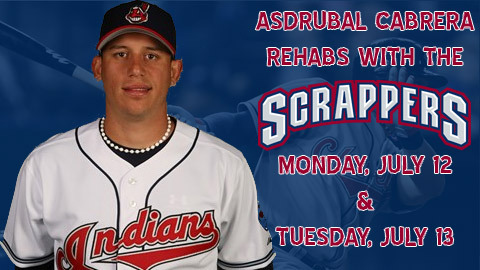 Niles, Ohio - Cleveland Indians shortstop Asdrubal Cabrera begins a rehab assignment on Monday with the Mahoning Valley Scrappers. Out since May 17 with a broken left forearm, Cabrera took batting practice today for the first time without pain. He plays with the Scrappers Monday and Tuesday before moving to AA Akron. Indians Manager Manny Acta said Cabrera needs at least 30 at-bats before rejoining the big league club. Previous Major League rehabs assigned to Mahoning Valley include Lou Merloni (2004), John McDonald (2003), Chad Durbin (2003), and Einar Diaz (2002).